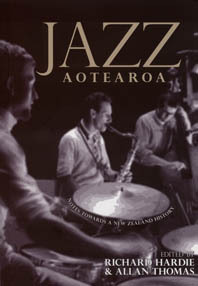 In 2003 New Zealand's first conference session exploring the history and impact of jazz in this country was held at Victoria University of Wellington. From the discussion and debate emerged a fascinating picture of jazz in all its variety and splendour: classic performers like Mike Nock and Allan Broadbent; world-class events such as the Tauranga Jazz Festival; livewire venues like Wellington's Space and Happy; and the challenging fusion of taonga puoro, traditional Maori instruments, with the saxophone in which the very definition of 'jazz' as improvised music is stretched to its limit. The common theme that confronts us is that we really know very little about a music that played such a significant role in New Zealand community life throughout the 20th century. Beginning with a perceptive look at the early forays into the world of jazz in Australia and New Zealand, Jazz Aotearoa marks the first steps in documenting the history and great moments of improvised music in this land. 103 p. : ill., map ; 21 cm. Chapters by Richard Hardie, Allan Thomas, John Whiteoak, Norman Meehan and David Edwards.